Martial arts are rife with paradox; preparing for war with a peaceful mind, honoring life while harnessing skills to end it, your best friends and brothers-in-arms the people you deal injury to on a daily basis. It is from places genuine warmth and peaceful existence that our two welterweight competitors emerge; ready to lay it all on the line for a chance at amateur title glory. For John McAndrews, his story starts as the prototypical “fat nerd”, a long-haired 240lb man with a love of Dungeons & Dragons and fantasy worlds. It was from the tales of swords and sorcery that McAndrews found himself interested in making games of fancy a reality, learning combative sword fighting in the modern age. A thirst for true martial combat saw McAndrews make the transition to small circle jiu-jitsu, taught by New England legend Nuri Shakir, with McAndrews edging closer to MMA, starting his amateur career at the age of 29. The reality of the situation was never lost on McAndrews; the time to go to the UFC and gain international stardom was over before he’d even started, yet he’d enter the MMA world with a hunger and determination few had ever encountered. Facing top-ranked fighter Sean Evans in a debut that would see the pair land well over a hundred strikes in an amateur bout, the tone was set for his career. Size being a determining factor in his debut loss, McAndrews would begin shedding weight and honing his body into that of a true fighter, working his way from 240lbs to a fight weight of 170, but bringing that heavyweight power with him. His fights in the Toe 2 Toe organization in Maine would see him chew up local talent piece by piece while his Combat Zone bouts saw him flatline his first opponent in under a minute; his second bout seeing him dispose of a growing talent from SYT in an ugly fight that highlighted his penchant for punishment. Now riding a five fight win streak and holding the Combat Zone 185lb title, McAndrews walks into his Cage Titans debut looking for another belt. For Bobby Gasdia, the persona of a ruthless fighter is oddly balanced by an infectious smile and bright personality. Having started his MMA career during school vacation, Gasdia’s MMA journey oddly began by defeating McAndrews’ training partner in his debut, scoring a submission win and showcasing his hybrid wrestling/BJJ skills. While his fight schedule is based around his school, Gasdia has found ways to work on his skill sets, whether it be the obvious advantages of wrestling at the college level, or the less obvious gains of taking ballet for a semester. Despite a cherubic face and a mind for inventive academics, the thirst for victory runs deep in Gasdia and he’s never been afraid to spill some blood to achieve it; be it his competitors or his own. Against Angelo Richardson, Gasdia felt the pressure of a close fight; battling out from under his gargantuan opponent and lining up punishment on the feet, scoring a split decision and keeping the young man’s win streak alive. If Richardson was a grind in the CT cage, his next fight was anything but, landing a KO off a counter right and a pancake sprawl on Scott Sullivan, having his opponent flat out in sixteen seconds. 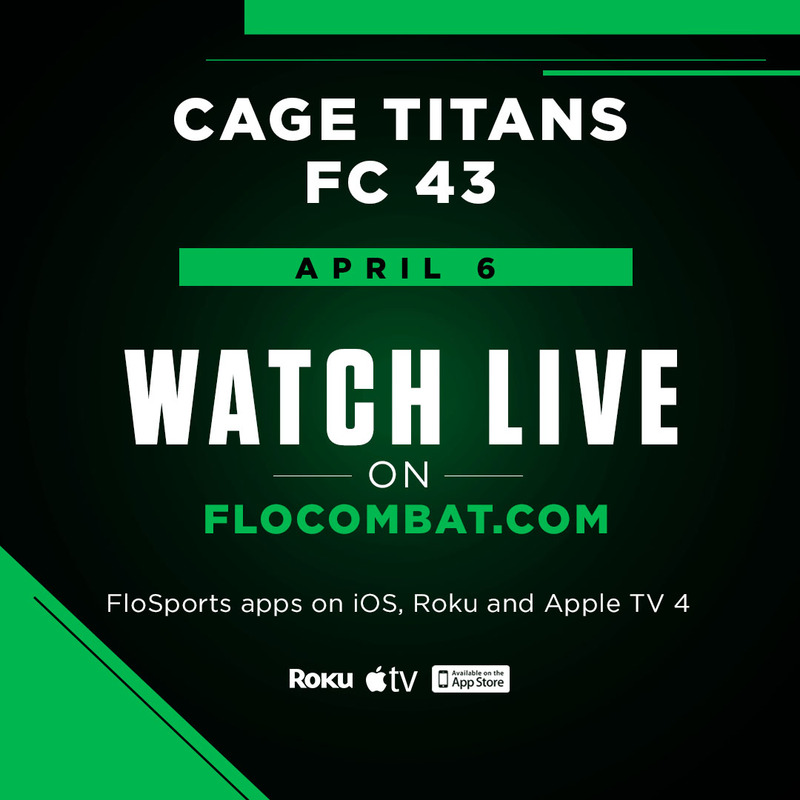 The defining moment for Gasdia would come in a jump up in division as well as opposition, taking on the devastating striker in Sean Bettencourt for Cage Titans 185lb amateur title. In a vicious display the two tore into each other with relentless power punching, Bettencourt getting the best of the match-up but having his rump hit the mat several times in the fight; whether by power double or a sneaky counter left that had him staggered. 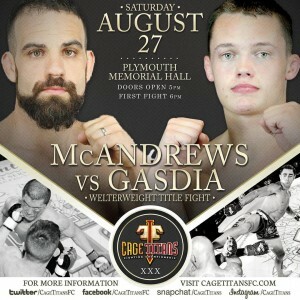 A family to support on McAndrews end, and school bells in Gasdia’s imminent future, the two gentle giants will set aside some time on August 27th to square up and contest for the Cage Titans 170lb amateur title.